Life With the Ladniers: What Time Change? David got up with Ayden this morning and while I snuggled back in to get a little extra rest I realized that we lost an hour. I don't mind losing an hour because 1) springing forward is yet another sign that Spring really is on its way and 2) I really love the extra daylight at the end of the day. So instead of snoozing a bit more we were up and at 'em (at almost 8:00 new time) and getting ready for our day. We had a photo shoot for our friends at 10 and the rest of the day was wide open. We had lunch watched a movie, napped, and went to our home site to plan out our driveway. David played with Ayden outside while I made dinner and I read to Ayden while David cleaned up the kitchen and ran the vacuum (it's that time of year when Maverick blows his undercoat. Gets us every time. SHEESH). Overall it was a great day but David and I were both feeling pretty ragged by the end of the day. Earlier in the day we had discussed making Ayden's bedtime a little later so we can all enjoy the longer days but we changed our minds by the time bedtime rolled around. Parents of a toddler boy work from "son up to son down" and we were ready for a break. We got Ayden to sleep by 8:00 new time (that's actually early according to his internal clock) and he went down without a peep. He has really gotten the hang of us just saying goodnight and leaving the room. We are going to work really hard to get to bed at 10:00 on the dot tonight. We both could use more rest! It seems as though our calendar books up with nicer weather. We have a pretty busy week ahead and a beautiful forecast to go with it. Can't wait to soak up some fresh air and sunshine! 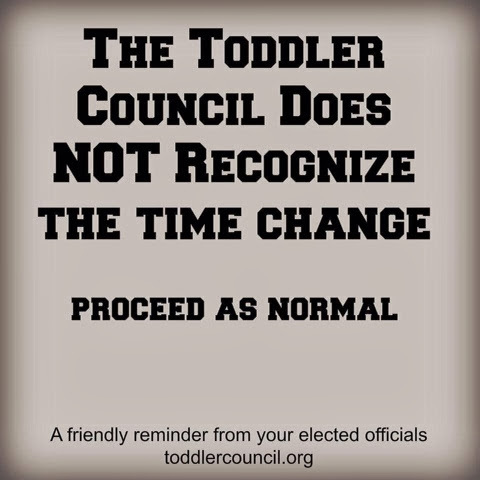 How does your toddler deal with time change? Here's what we were up to one year ago today: "Evolution of Attachment"
And two years ago today: "Spit Happens"
I bet you are tired! I have been there with the waking every hour thing and it is NOT fun. However, it sounds like you are trying everything I have tried but our babies are different kids and different ages. I don't think Ayden would have responded as well to everything we have done at 10 months as he did at 23 months. At 10 months we just had Ayden in bed with us and though we woke a lot, it is still the arrangement that got us all the most sleep. I'm sorry that I couldn't be more help. It is hard to give specific advice when you are not the one living the reality. I am here for you to offer support though! Keep trying new things, you will eventually find something that works for your family.